Multicolor pearls are one of the hottest trends this year. Freshwater pearls come in various pastel shades of white, pink, peach, lavender, plum, purple, and tangerine, depending on the type of mussel. Freshwater pearls come from freshwater mussels. Nothing is more natural than a pearl. Unlike gemstones, that are cut and polished to unleash their beauty, pearls emerge from the creature that conceived them. Genuine 9 to 10mm lavender freshwater button pearl. Sterling silver and white gold plate. Natural Freshwater pearls are formed within a mussel. These mussels open their shells slightly and allow water to flow in, so that they can take nutrients from the microscopic particles and organisms in the water. Small irritants such as small animals can also float in. Parasites can drill right through the mussel's hard shell. To protect itself, the mussel encloses the irritant in a sac and then secretes layer upon layer of nacre around the irritant, that in time produces a lustrous pearl. Natural multicolor pearls: white, pink, and lavender. 8mm pearls suspended from a 16" chain. Sterling silver chain and setting. Freshwater pearl color is determined by the mussel itself and environmental factors that affect the nacre as it is layered. The most prevalent natural colors are whites, as well as pastel colors in both pinks and lavenders. White pearls are still by far the most popular, but pastels in pinks and lavenders have slowly edged their way into the fine jewelry marketplace. The two colors are very popular for second strands, mixed-color strands or when a less traditional look is desired. Light pink and lavender are naturally occurring colors in freshwater pearls, but their colors can be enhanced after processing. 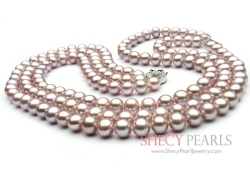 These 8-8.5mm, AA+ quality pearls have a great luster and inner shine. 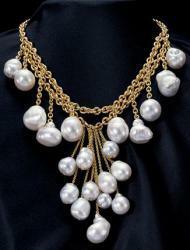 The necklace is 18" long and is strung on double silk thread, knotted between each pearl. The clasp is solid 14k gold. The value of Freshwater pearls can vary based on specific factors such as roundness, luster, size, surface quality, and color. As the pearls are nucleated with only tissue, they are 100% nacre. Pearl matching for finished jewelry pieces is also very important. As cultured freshwater pearls are tissue nucleated only about two percent of any given harvest is round. As a result, roundness is one of the most important factors in the evaluation of freshwater pearls. 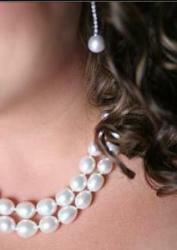 Pearls produce an intense, deep shine called luster. This effect is created when light reflects off the many layers of tiny calcium carbonate crystals that compose the pearl. This substance is called nacre. The more light reflected and the clearer the image, the better the pearl's luster. The luster of Freshwater pearls may be different than those of saltwater. Freshwater pearls tend to have a satin finish. Pearls can range in size from 1mm seed pearls to huge 20mm South Sea pearls. cultured pearls of 6 – 7.5mm are the most common, above this size the price jumps upward rapidly with each half-millimeter from 7.5mm up. To date the largest pearl recorded is a 26.95mm baroque south sea pearl. A & Z Pearls, Inc. is a jewelry manufacturer who specializes in pearl jewelry – which is obvious from the company's name – but what may not be so obvious is that along with the usual fine pearl jewelry collection you can find on this site, you can also find one-of-a-kind pearl masterpieces like this little angel made from pearls and 18kt gold. I think is very cool how they used some of the natural shapes pearls come in and created jewelry art pieces around them. It sort of reminds me of when you are looking at clouds and one cloud might look like a cow and another might look like a bird. So enjoy. I lifted a few here from their collection, but there are a lot more on their site. I think the swan is my favorite because it reminds me of that poem, "Leda and the Swan."